The simplest way to routinely clean your granite is by making a soap solution by diluting dish detergent with warm water. 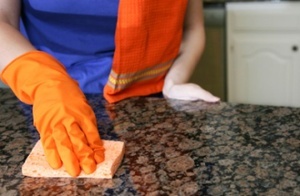 Wipe the surface with a rag or towel dipped in the solution and work your way across the stone countertops using circular motions to ensure an even polish. You can also make a cleaning solution with a small amount of ammonia or bleach and warm water. Ammonia is better because its basic rather than acidic, which is less likely to cause long-term damage to the stone. CAUTION: Never mix them together—combining ammonia and bleach produces a deadly toxic gas. Porous and/or untreated stone can acquire stains over time. The best way to remove oily or fatty stains from your stone is to liberally apply talcum powder or a mixture of baking soda and water and leave for a few days. These chemicals will draw out the oils in the stain and allow you to wipe them off with a cloth. Other persistent stains can come from paints and inks. To remove paint and ink stains from your granite countertop without scratching or scrubbing the stone, use acetone or mineral alcohol. Wearing gloves, make a diluted solution with warm water, and rub off the stain with a cloth. 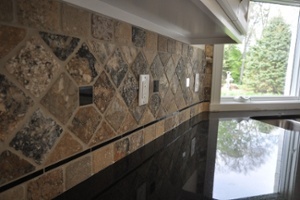 Now that you cleaned your granite, you want to make it shine as brightly as possible. Some household polishing solutions include salt water, glass cleaner, and floor wax.